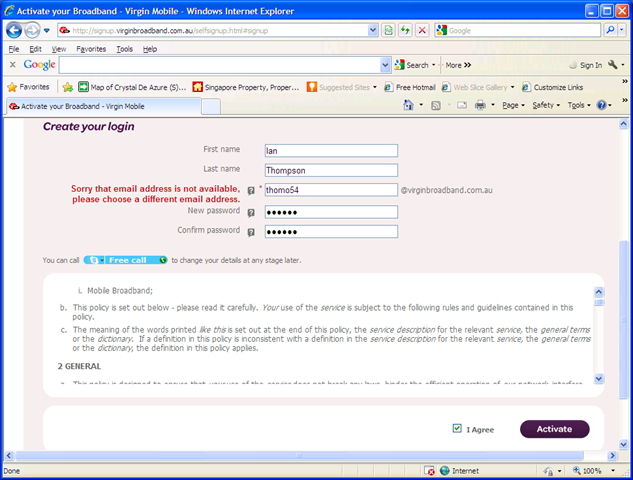 I went to register and activate my Virgin Broadband service today. Many of you will know that my nickname is Thomo the Lost – that is, “thomo” with a single “m”. I was asked to register a user name that was to be included in yet one more email address for me (why can’t I just use my own bloody email address that I have had for 10 years now and that Virgin already has from my mobile service?). I went to register variations of “thomo the lost” only to be told each time that the “email address is not available”. I checked “thommo” and was told that was used, so I tried “thomo54” (no prizes for guessing what the “54” was). I received the “email address not available”. When I changed it to “thommo54” it all went through. So now Virgin, you have insulted me. You have prevented me using a nickname I have used for 10 years because it appears as though the problem is the name has the string “homo” in the middle of it. Virgin Broadband is using the same validation tools as Facebook is (where I was similarly prevented from using “thomo”). Hello people, this is 2011. We have ways and means of determining if “naughty words” are being used in someone’s userid without having to be so bloody simplistic. How did it end I hear you ask? I used “thommo54” and was told that the backend apparently had a problem that the technicians were looking at (seriously – and after banning “thomo54” as a userid). I was told to please try again later. I did, and guess what – Virgin then told me “Sorry, your service has already been activated. Please contact support if you feel this is an error.? So, my user experience with Virgin Broadband after one whole hour of involvement – poor. Starting to wonder whether I should just move my mobile service now!